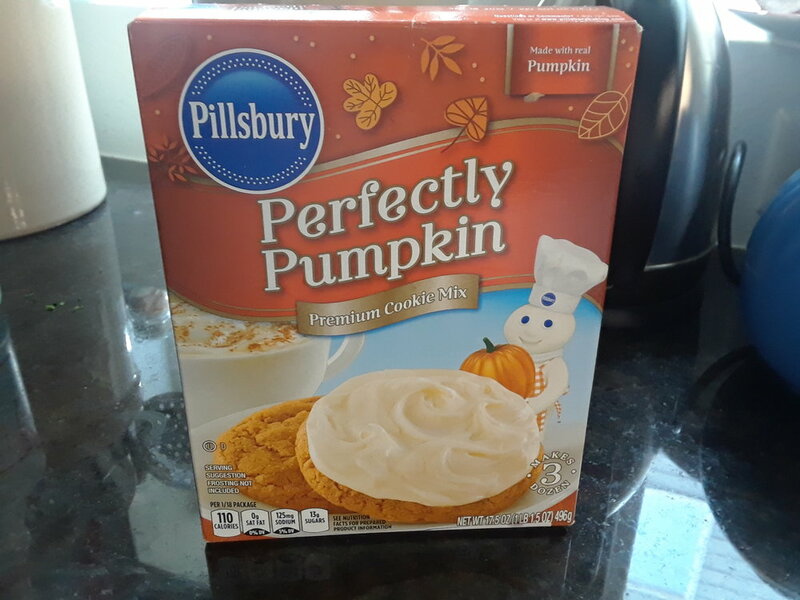 Here's a statement that irritates me: Enjoy the fall flavor of pumpkin cookies made with Pillsbury™ Pumpkin Cookie Mix. Now, I have nothing against Pillsbury. Quite the contrary, in fact, if you are familiar with my well-documented history of obsessing over the doughboy. Nor do I have anything against box cookie mixes, though homemade is always preferable. It's the inevitable tethering of "pumpkin" to "fall" that gets my goat because of the implicit assertion that pumpkin-flavored baked goods should only be enjoyed during autumn. Obviously, that practice arose from the fact that pumpkins are in season during those months, but, thanks to the good people at Libby's, there's really no reason why this ingredient, so lovely in its versatility, can't be incorporated in cooking and baking year-round. End of rant. Isn't his orange checkered apron the best??? My Harry Potter house crest cookie cutters from Williams-Sonoma, which I bought heavily discounted during a recent stress-shopping binge, arrived simultaneous to my discovery of a Pillsbury Pumpkin Cookie Mix I bought last November in the back of the pantry. At the time, I remember thinking, "Your Future Self will thank you when you're craving pumpkin at an 'off' time." Well, you were right, Past Self. Now, technically, pumpkin JUICE cookies would be the most appropriate medium on which to test Harry Potter cookie cutters, but that's a labor-intensive project for another day. 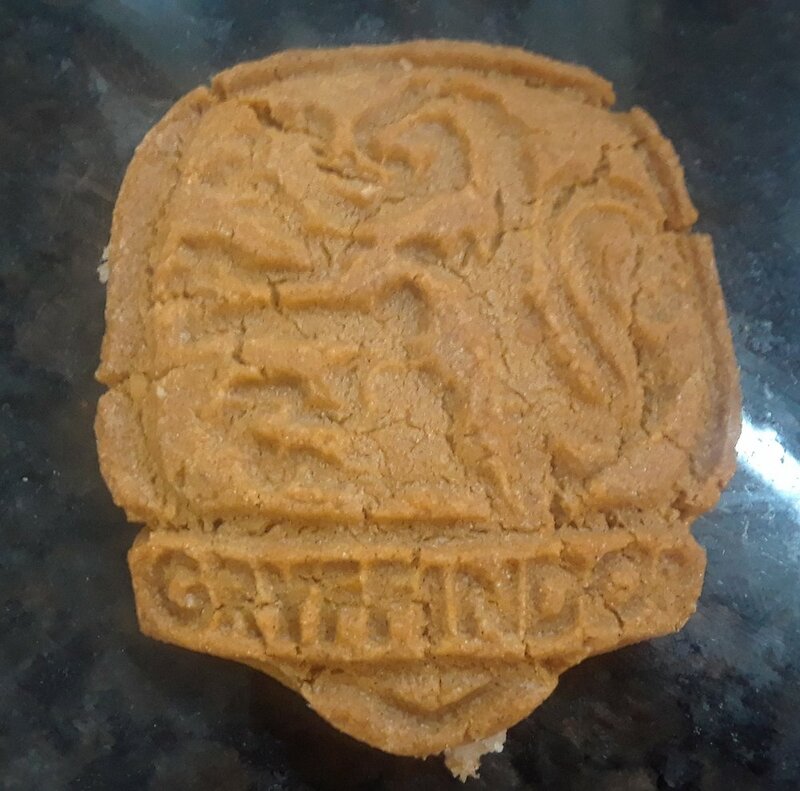 I was disappointed that the resulting cookies' surface lacked the clarity I was hoping for in the house crests, whose finer details blurred in the fiery heat of the oven. Additional testing with recipes expressly designed for thick, contoured cutters is definitely in order. 2. Combine cookie mix, softened butter and egg in medium-sized bowl. 3. Mix with spatula until a supple dough forms. 4. On a lightly floured surface, press dough by hand into large flat rectangle. Apply cookie cutters. Combine scraps and repeat until you have as many cookies as you want. 5. Bake 9-11 minutes. Cool completely and enjoy with your favorite muggle.